Sketchnote reflections on MA Education. Technology Creativity and Thinking: Creativity and Educational Futures. Creativity has always driven my practice as a teacher of visual art. It is at the heart of what I teach and is a fundamental skill relevant to all subjects of the curriculum. In this commentary, I will reflect back on aspects of the Creativity and Education Futures modules that have ignited interest and possibilities to improve my own and other educators’ practices. I work in a large K-12 International School in Singapore in an art department of 8 teachers. I am also a Digital Literacy Coach which allows me to work with a wide range of teachers across the school engaging in conversations and collaborations to improve student learning. As a 1:1 laptop school technology dominates the classroom for organisation, sharing resources, research, collaboration and creating content. Throughout the module, I frequently returned to the work of Anna Craft and Sonail Inayatullah, in particular with regard to future theories, Possibility Thinking and the 4Ps to explore directions for the future of art education and what this might mean for our students. Participating in conversations about probable, possible, preferable futures has kickstarted my thinking about the development of the subject and what changes need to be put in place to drive us forward. In my previous presentation and essay, my investigations centred on the inclusion of play and experimentation and how art might evolve with emerging technologies and pedagogy surrounding new literacies. but what does this actually look like in our day to day work with youngsters and what exactly might a sustainable future be? Whilst applying for a leadership position within the department I wanted to delve deeper into investigating sustainable education and this has helped to determine what the department needs to change to address future concerns. What skills will be relevant for an unknown future? What will an art curriculum look like? Building a curriculum that is both relevant, long-lasting and flexible is quite a challenge. Investigating various schools in my region, the teaching of art varies enormously. In local schools, the skills focused on are often traditional: skills of drawing and painting, history of art. Art is not seen as a core subject and the focus is on STEM subjects with Mathematics being a priority. Singapore is a multicultural society and even within my own school, parents are most keen to see their children progress highly in Maths and Science with high scores and examination results, leaving them at the top of world league tables. Much like schools in the UK, the Arts feature as electives beyond 14. However, in the IB curriculum, holistic education is a key principle and students are encouraged to balance their subjects. Even so, many students do not take a creative subject. There is often an assumption held by many that creativity is only appropriate in the arts and that creativity or creative thinking is not relevant to the rest of the curriculum. However creativity is now one of the top 3 skills needed to prepare students for the future, and it champions the need for such a skill or competency to be embedded across the curriculum (WEF, 2016). Creativity is not just for the arts, it is a fundamental life skill and our future will depend on creative thinkers and innovators to solve big issues like climate change, world peace, or poverty. At the beginning of this course, I reflected that creativity is all about thinking, experimenting, failing and often involved taking risks. All these capabilities reside not solely in the Arts but across the curricula. Whilst teaching students how to take notes more visually, they discussed their own views on creativity through sketchnotes and common ideas were seen again: ideas, messy, collaborative, making something new, innovation. When educators were asked the same question through a Menti poll, further definitions could be seen including curiosity, open-mindedness, exploration, all of which are applicable schoolwide. Presenting recently at Innovation in Schools, I shared the need to teach for creativity rather than teaching creatively. The latter suggests being inventive about how we teach but neglects how to foster and develop creativity and creative thinking. Patrick Green, at the same conference, talked about student choice being at the centre of creativity, using the example of his 7-year-old son whose creativity was stifled by teachers micro-managing a project and restricting choices. Whilst this example focuses on Primary education the same can often be the case in High School, where learning is predominantly content driven. Where is the time for creativity? My husband teaches IB Physics and sees students consumed by the demands of such a content heavy curriculum, but he also understands how students learn best. We discussed at length how, in order to investigate science, one needs to experiment, play with ideas, concepts and materials. Most scientific breakthroughs may not have occurred if it hadn’t been for playfulness, risk-taking and possibility thinking. With this, he concluded that Science is creative and the need to push this skill imperative to help develop rounded and innovative scientists in the future. Indeed Oded Ben-Horin et al describe creativity in Science as “generating ideas and strategies as an individual or community” citing again Craft’s everyday creativity, where teachers lead purposeful activities to promote engagement and thinking (Ben-Horin et al, 2017). Sir Ken Robinson berates schools for “killing creativity” and for “educating (students) out of their creative capabilities” (Robinson, 2006). More often learning is about remembering and recalling facts, figures, and information. Universities require this acquisition of knowledge and judge students on their success by their final numerical grades. How does this show what a student is truly capable of and how they might be successful in a particular field of study? Perhaps institutions should be looking at holistic skills including creativity, problem-solving and thinking as the new competencies for the future workforce. “Creativity is as important in education as literacy and we should treat it with the same status” (Robinson, 2006). In Rhetorics of Creativity, Banaji, Burn and Buckingham describe creativity as “inherent in the everyday cultural and symbolic practices of all human beings” (Banaji et al, p. 57). This ordinary creativity mirrors Anna Craft’s view where she explores little “c” creativity, the thinking and ideas which occur in the mundane activities of daily life or the small moments of imagination. This, of course, differs greatly from high creativity, Big C creativity or Pro (Craft, 2001) the work of professionals or experts. Creativity does not have to be the complex and time-consuming add-on that many believe to be the case. Allowing students the time to think for themselves, to explore and experiment with thinking and ideas will allow this everyday creativity to flourish across the curriculum. My everyday creativity is sketchnoting, as can be seen in the reflective portfolio, and I teach this skill to students and staff to help them synchronise their thinking and to share and organise important information for better recall. Initially, I take notes in a notebook and revisit these to elicit the big ideas, capturing this as a large image. I extract key points to delve deeper, including text and images to capture and recognise these points. It is time intensive, but an enjoyable and valuable process and one I wholly believe in and promote. Reflecting on the findings in Chappell and Craft’s “Creative Learning Conversations”, I see evidence in my classroom of the positive implications of meaningful conversations and discussion (Chappell and Craft, 2011). Mapping these conversations in ways that can be revisited and reflected upon is an important element of their work. Sketchnotes allow individuals to review their thinking and to share with others. I use the Harkness table for discussions with an online backchannel Today’s Meet. In a fishbowl style scenario, students discuss as I “map” the conversation on paper. I observed a Primary teacher using an app called Equity maps, to see data and trends on individual participation, sharing this with her students, thus involving students in the process. I use Padlet to track student progress and this space allows them to reflect, feedback and share their learning with others. Padlet is a very versatile platform and teachers use it for sharing book reports, as a discussion tool, podcasts, resources and for portfolios. As a public space, it is always important to consider the audience and the ethics of what to share and to whom, so there are inbuilt tools to adjust this depending on requirements. Craft describes participation in terms of “joining in and being heard” as one of the important aspects of playing in a “dialogical space” (Craft, 2011, p94) and in a digital space many voices can be both seen and heard. We use an online learning platform and this interactive, participatory space allows for multiple interactions between students and teachers or peer to peer. I can pose questions, allow students to investigate and share their thinking as a conversation, locking comments if I want them to think for themselves. In a safe environment, this allows students to learn the nuances of respect, questioning and conversation in preparation for real online public spaces. Technology has allowed us to redefine social engagement and to engage students in conversations both in and out of the classroom. Collaboration and connectedness are a fundamental part of students daily lives and Chappell talks about wise humanising creativity as a way of empowering individuals to work collaboratively towards change (Chappell et al, 2012). With this in mind, student voice has become an important part of my research into how art education might look in the future. In “Creative Schools”, Ken Robinson focuses on student voice and of the need for more personalization and flexibility of teaching. Often students have to fit with the system and schedule not the other way around. I am constantly drawn back to Craft’s thoughts on this evolving world students are living in, described as the 4Ps and of the connections between them. In my previous post, I focused on the importance of play in learning but I would like to explore further the aspect of “possibility-awareness” to nurture creativity and address future thinking (Craft, 2011, p33). In a rapidly evolving digital world, learning and teaching have to change and Craft’s 4P’s are a way to investigate opportunities to become more aware of the changes needed. Recently my school has developed a 5-year strategic plan with the vision and pointers to address aspects of our mission and values. This maps where we want to get to but not the details of how to get there. This is where possibility thinking comes in, and as I look to the future of how to lead the art department, this approach will allow me to involve all stakeholders in the conversation and of aspects that require change. One of the powerful aspects of Possibility Thinking involves question-posing and this, in turn, leads to innovation and creative thinking. Questioning in the art classroom involves asking students to interpret what they see, think and wonder, a common thinking routine I use. It can spark debate and discussion or trigger ideas and develop imagination but also open up new directions for learning. Through enquiry, at any level of the school, students are able to research, make decisions, weigh up options, create new thoughts and debate ideas (Craft et al, 2014). Possibility thinking, coupled with future thinking, specifically alternative futures (Inayatullah, 2008) is helping me to build a vision for the art department. With the rise of Maker Spaces and recommendations from the Horizon report (2017) for adoption, more schools are developing dedicated spaces for creation and invention. Students in my school have access to the Ideas Hub where they can make, tinker and play with a multitude of materials and processes to invent and collaborate. There are competitions and community events and creativity is truly valued here, outside of the curriculum. How can we model creative thinking and teach the skills relevant to our subject? Where is the time for creativity? In my initial presentation on learning and play, I focused on Inayatullah’s alternative futures and the importance of having a vision for the future rather than a determined roadmap, where previous notions of looking to the past or used futures restricted thinking or gave predictable results. With this in mind, applying for the Head of HS Art position at my school, I set out to talk to students (and staff) about what a possible and preferable future for art education might look like. Students have a solid foundation of skills resulting in excellent grades, taught by a team that has worked together for many years. The curriculum has changed over time in content and with the integration of the online learning platform and digitising of the IB coursework. As with many departments, students yearn for the answers without the thinking. How can it be even better for its students and bring back the joy of making art? Do students think enough about their ideas and reflect on the process of working and the work of others to help develop meaningful ideas and decisions? Thinking takes time and energy and is hard. But to be successful in the future, students need to develop these skills to be able to digest and make sense of information and envision where and how to use this to innovate and solve problems. Talking to students about what they see as the future in art education surprises me as they are seduced by the developments in technology yet impassioned by the hands-on nature of art materials. How can we marry these two seemingly polarised approaches to art? In order for art education to be sustainable we need to build capacity in our students to be able to think for themselves, not just to solve problems but the find problems that need solving. We need to give opportunities to build critical skills and creativity by giving them space and the time to play and experiment and in turn create their own paths of discovery. Guy Claxton talks about building “resilience, resourcefulness, reflection and reciprocity” (Claxton, 2012) to develop critical thinking skills. These “learning powers”, the 4Rs, exercise the brain to improve learning, just as building muscle develops strength in our bodies. What is education for and how can we build an education that is sustainable? As this debate continues, collating conversations about future thinking must include students’ ideas. Our mission includes the phrase “for a sustainable future” and it is this that I constantly revisit when grappling with a vision for the future. What is a sustainable future? Educating for sustainability suggests teaching to develop responsible citizens for an unknown future, aware of the effects and consequences of their actions, on others and the environment in which they live. Stephen Sterling describes 4 descriptors of sustainable education: sustaining, tenable, healthy and durable (Sterling, nd). He explains that we are all important factors in this conversation and that “learning about learning” is a key part to assist us in developing a relevant education for the future. Could this guide our vision? Students have idealistic or imaginative ideas about the future based it on current realities. Most talk about digital alternatives and emerging media, AR, virtual worlds, gaming and Ai. But others thought more about creating a balance between traditional and digital. Living a totally digital existence much like the characters in Ready Player 1, a book set in the future seems very likely but relationships, connecting on a face to face basis and collaborating is still important to youngsters. Considering alternative futures, we may need to disown certain futures (Inayatullah, 2008) discarding negative or unwanted possibilities. For learning to be sustainable, including real-world contexts must be prevalent so youngsters can make sense of and see the relevance of their learning. We do this through enquiry and concept-based learning at UWC and value student ideas. Why and how do we foster agency in our learners? How can we help them become independent, engaged and confident learners through voice and choice. We must exercise our creativity and go back to playing and experimenting, as we did when we were young, to be able to survive and thrive in the future. Banaji, S., Burn, A., & Buckingham, D. (2009). The rhetorics of creativity: A review of the literature. The Rhetorics of Creativity: A Review of the Literature. Centre for the Study of Children, Youth and Media, Institute of Education, University of London. Ben-Horin, O., Chappell, K. A., Halstead, J., & Espeland, M. (2017). Designing creative inter-disciplinary science and art interventions in schools: The case of Write a Science Opera (WASO). Cogent Education,4(1). Chappell, K., & Craft, A. (2011). Creative learning conversations: Producing living dialogic spaces. Educational Research,53(3), 363-385. Chappell, K., Hetherington, L., Ruck Keene, H., Slade, C., & Cukorova, M. (n.d.). Creations: Developing an engaging science classroom. Chappell, K. A., Pender, T., Swinford, E., & Ford, K. (2016). Making and being made: Wise humanising creativity in interdisciplinary early years arts education. International Journal of Early Years Education,24(3), 254-278. Claxton, G. (2012). Building learning power: Helping young people become better learners. Moorabbin, Vic. : Hawker Brownlow Education. Craft, A. (2009). Creativity in schools: Tensions and dilemmas. London: Routledge. Craft, A. (2011). Creativity and education futures: Learning in a digital age. Stoke on Trent: Trentham. Craft, A. R., & Chappell, K. A. (2014). Possibility thinking and social change in primary schools. Education 3-13,44(4), 407-425. Craft, A., Chappell, K., Cremin, T., & Jeffrey, B. (2015). Creativity, education and society: Writings of Anna Craft. London: Institute of Education Press. Facer, K., Craft, A., Jewitt, C., Mauger, S., Sandford, R., & Sharples, M. (2009). Building Agency in the face of uncertainty. Facer, K. (2011). Learning futures: Education, technology and social change. Abingdon, Oxon: Routledge. Inayatullah, S. (2008). Six pillars: Futures thinking for transforming. Foresight,10(1), 4-21. Inayatullah, S (2008). Mapping Educational Futures. Six Foundational Concepts and the Six Pillars Approach. In Bussey, M., Inayatullah, S. & Milojevic, I. (eds). Alternative Educational Futures: Pedagogies for Emergent Worlds. Robinson, K., & Aronica, L. (2016). Creative schools: Revolutionizing education from the ground up. London: Penguin Books. Sahlberg, P. (2015). Finnish Lessons 2.0: What Can the World Learn from: Educational Change in Finland?:2nd. New York: TEACHERS COLLEGE Press. Sterling, S., & Orr, D. W. (2001). Sustainable education: Revisioning learning and change. Cambridge: Green Books. Sterling, S. (2010). Learning for resilience, or the resilient learner? Towards a necessary reconciliation in a paradigm of sustainable education. Environmental Education Research,16(5-6), 511-528. Sterling, S. (n.d.). Sustainable education –putting relationship back into education. Cultivate Mag 9. Walsh, C., Chappell, K., & Craft, A. (2017). A co-creativity theoretical framework to foster and evaluate the presence of wise humanising creativity in virtual learning environments (VLEs). Thinking Skills and Creativity,24, 228-241. As an art teacher and digital literacy coach, it is important to me to consider how art education might evolve in the future and what role technology might play. As I investigated the role of creativity, it became clear that the misconception of creativity as solely for the Arts is a common one. Rachel McGarrigal, suggested that this was true for her and that she “had been guilty of thinking that creativity was a synonym for the Arts”. She cited Anna Craft, saying “In the economic environment, the terms ‘entrepreneurship’ and ‘enterprise’ are used, whereas in sociology the term used is ‘innovation’. Yet in education and psychology, the term ‘creativity’ is widely used” (Craft, 2001). It is clear that this may be where the assumption arises that creativity and the arts are mutually exclusive. Banaji and Burn’s article, “Rhetorics of Creativity” formed a springboard to many aspects of creativity theories and it was at this point that I had to decide which were most poignant to the future of art education in particular. Craft’s writings on possibility thinking and playfulness guided me in choosing avenues to explore in relation to the future of education. Whilst reading Banaji and Burn’s article, play seemed a common link throughout. In a conversation with Judith Kleine Staarman, it became clear how creativity and play are a fundamental aspect of learning and how influential Finland’s educational philosophies are becoming to the rest of the world. Recent articles in the media talk about the importance of “soft skills” (Ma, 2018) and this is reiterated by Krista Kiuru, Finland’s minister of education and science, regarding the importance of developing emotional intelligence, vocational courses and values beyond academics (Gross-Loh, 2014). My presentation centred around the connection between possibility thinking and alternative futures for art in a digital context, citing recent reports on the necessity of creativity as a core skill and the works of both Craft and Inayatullah. I talked about how play and creativity are interconnected, and I will explore possible digital futures further. It is clear that despite an uncertain future, digital and media literacy is a necessary fluency. You only have to look at the rapidly advancing developments in the past 5-10 years to realise that it is even more important to prepare our students for this uncertainty by giving them the skills to creatively work through this change. I wanted to explore what creativity meant to me and my school context, to examine how art education is changing and what it might look like in the future, looking at the possible discord or cohesion of traditional art education and the emergence of new technology. I see many practices of creativity inherent in the arts, yet other subjects focus on knowledge and content, driven by exam requirements. So where is the time for creativity? But shouldn’t we be asking where can creativity be built in to the already existing curriculum, rather than as an add on? Figure 2: Menti poll What is creativity? Looking at Figures 1 & 2, one can see creativity is not tied only to the Arts: problem-solving, divergent thinking, play and curiosity exist in all of us. Craft discusses that, since the shift to STEM, there is even more need to bring back creativity across the curriculum. Invention and innovation are at the heart of STEM and the Horizon report now supports STEAM to incorporate key aspects of the Arts to drive creativity (Horizon report, 2017). Craft and Jeffery make clear distinctions between “teaching creatively and teaching for creativity”, the latter impacting the development of this key skill rather than lessons becoming more entertaining (Jeffery & Craft, 2010). John Dewey said that everyone is capable of being an artist. Often individuals regard artistry and creativity as a gift, or that you had to be born with it, but as Craft explains this assumption should apply to historical geniuses like da Vinci, Einstein and Mozart (known as Big C creativity). Conversely, little “c” creativity, relates to personal creativity and can be distinct from the Arts: a new idea or creation such as a poem or recipe. Ken Robinson reiterates this, discussing the imagination and “genius” of primary children (Robinson, 2006) and Craft reinforces the notion that everyday creativity is needed to cope with the rapidly changing society we live in. Conversely, Banaji and Burn explain that creativity often arises from “routine” just as your best ideas might arise during a shower or when dropping off to sleep. They reinforce the idea of ubiquitous creativity and that individuals who are not naturally creative may develop creative abilities and awareness through their engagement with arts projects and collaborations (Banaji & Burn, 2010). Linking to the idea of working together in creative spaces, the rise of Makerspaces has ensured that more schools help students to engage in play and making for enjoyment or to pursue a passion independently. This spike in interest has resulted in new learning spaces like our “Ideas Hub” (Figure 3) bringing together art, design, technology, engineering and science for all ages and with innovation and play at the heart. Virtual spaces, social media and games often incorporate play based elements. Understanding popular culture and the way youngsters communicate, interact and play today is relevant to affect change in our teaching content and style. Inayatullah’s future theories discuss moving away from a used future, where nothing really changes, towards alternative futures. To plan for an uncertain future, we need to help students to learn how to learn and become more independent and self-managed about the relevant skills to equip them for change and a diverse world. It is in this way of thinking that consideration can be given to “impossible futures”. Inayatullah et al talk about having a vision of the future rather than a set out road map. We need to consider unique possibilities “that change the direction of reality” (Bussey, Inayatullah, Milojevic, 2008). Some aspects of the future can be mapped based on current trends and developments in globalisation and technology advancements such as virtual reality and artificial intelligence, but it is about being open to a range of alternative futures and possibilities rather than a single one future ahead of us. At the heart of these alternative futures lies creativity. Creativity is as important in education as literacy, and we should treat it with the same status (Robinson, 2006). At the heart of creativity are play and experimentation. In my presentation, I used Craft’s theory on probable, possible and preferable futures and possibility thinking to think about how the future of art might look. Probable futures for art may entail addressing digital futures, moving from traditional materials based lessons to a laptop or tablet. A possible future of art could see both formal and emerging art forms taught to complement each other and a preferable future might be a seamless integration of technology alongside traditional skills with personal choice at the centre of learning. This view of art may not be every art educators ideal, yet we must move the curriculum forward to ensure art is not pushed out as a subject and that it remains relevant in a future digital world. Whatever the future of art education, play must still form a central part. Howard Gardner said that “an intelligence entails the ability to solve problems or fashion products that are of consequence in a particular cultural setting or community” (Gardner, n.d) and that intelligences involve various amounts of human endeavour. Everyone, he says, possesses these intelligences or “abilities, talents or mental skills” in varying degrees. He describes examples of these intelligences as writing a story or playing chess and the same could be applied to the arts and creativity. This is particularly true in regard to problem-solving “from scientific theories to musical compositions to successful political campaigns” (Gardner, 1993). 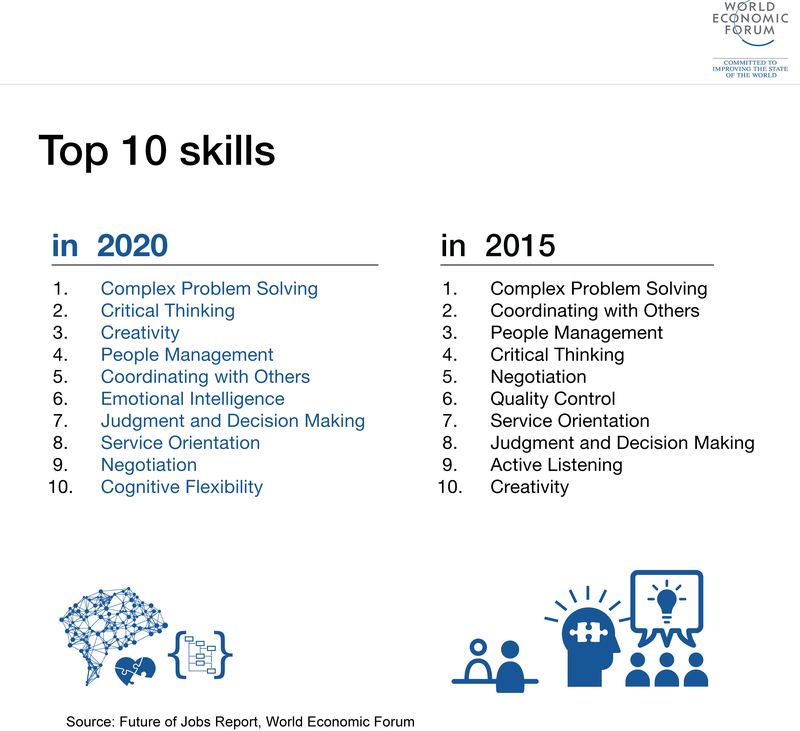 As reported in the Future of Jobs, complex problem solving remains the top skill required now and in the future (Figure 4) and goes hand in hand with creativity when regarding issues of overpopulation, conflict and climate change. Csikszentmihalyi states categorically that “there is no question that the human species could not survive if creativity were to run dry”. He equates the future to survival and that developing new solutions will be dependent on creativity. Ironically these modern and future problems were brought about by our own ingenuity and “yesterday’s creative solutions” (Csikszentmihalyi, 1996). As we lead increasingly technology-driven lives, we need to become more self-directed. Craft describes this personal agency as “little-c creativity”. In Figure 5 below, we see the increasing impact the 4 forms of creativity have on others and specifically where this relates, with little-c, to aspects of our daily lives. Craft explains how important little-c is in coping with change and dealing with small levels of creative problem solving (Craft, 2005). Craft describes possibility thinking as “the engine that drives little-c creativity” and Burnard’s diagram (Figure 6) describes key features of PT to include innovation, imagination and play. It is interesting to note the mirroring language with the poll on “What is Creativity” in Figure 2. Reading Craft’s thoughts on play and playfulness to engage and foster creativity draws me back to my classroom practice and the nature of experimentation in art. Risk taking is inherent in teenagers whether through gaming or sports, yet this free-play or abandonment of childhood often dissipates the older they get. With this in mind, I would like to focus on aspects of ubiquitous creativity and the connection between play and creativity. Craft discusses at length how Possibility Thinking is used as a lens for understanding creativity, specifically in the early years’ context. She describes “What is” to “what might be” and through this shift “PT might include questioning, imagination and play” (Craft, Chappell, Cremin and Jeffrey, 2015). This process of inquiry and inquisitiveness, natural in young learners must also be continued as they progress through school and into adult life. Creativity has been noted as a fundamental skill for the future of education alongside critical thinking and problem-solving. These 3 interconnected skills are the foundation of art and design education and the inclusion of these are relevant throughout the curriculum. Margaret Boden states that exploration is the start of creativity: by exploring an idea, many possibilities spring up and this in itself is creative. Because of this, one can surmise that creativity has a lot in common with play, often “open-ended with no particular goal or aim” (Boden, 2004). Exploring within one’s mind, she describes as “mental maps”. This conscious and subconscious thinking is not related solely to one curriculum area and mind maps are commonplace across learning contexts. As with scientific and computational thinking or decision making, a journey must occur to solve a problem or explore solutions. When facing unknown futures and possibilities, being conscious of how a future can be mapped out can help embrace change. With technology changing rapidly, education institutions need to be able to explore many ways it can enhance learning. Generation Z are more adept at trying out new things. Just as they might explore a new game or app, they learn by trying, failing, trying again. Boden describes creativity as “playing around”, just as a child plays with a string of beads or a pile of lego to make something new. Play in the young is a natural process to learn about the world and its possibilities. But as we get older, even by early teens, this ability to play freely is diminishing. However, according to Boden, playing is a way of “comparing one way of thinking with another, mapping one onto the other” just as one does with Maths or Science (Boden, 2004). Craft reinforces the idea of play and creativity, relating possibility thinking and the use of technology to amalgamate the actual and online spaces our students learn in. At the centre of research into the benefits of play is the Playful Learning Center, Helsinki. In Finland, play forms a large part of the students’ day. Kristiina Kumpulainen, talks about playful learning as “an attitude to life” and explains how important the nature of creativity is when one makes something not imagined before. The most effective way to engage others in this experience is to listen and join in, just as one would as a parent with your child and this philosophy can be applied in the classroom with the adult learning alongside a child- to play together to learn together (Kumpulainen, 2016). Listening to the ideas of Kumpulainen and the nature of learning and play helped me to see a possible future for collaborative learning in art. Watching my Middle School students play with new sculptural materials and ideas, learning together, reminded me of how their social worlds are built on communication and connections. Elliot Eisner believed that studying the Arts helped develop the holistic child and that part of this theory included critical understanding and thinking skills, amongst others. He talks about the relevance of artistic endeavour to all aspects of the curriculum. Often schools focus on achievement and academic success rather than building on inquiry. Herbert Read describes the process of “being artistic’ not as a practice only by artists but that the creation of work from ideas, imagination and thinking is relevant to any discipline. Therefore this approach should be clear across education and relevant to professions as wide afield as mathematicians, engineers or surgeons. Similarly, Craft says, in order to foster creativity, classrooms should allow for “mistakes and encourage experimentation, openness and risk-taking” (Craft, Chappell et al, 2015) and these are skills for life. Returning to the future of art education draws me back to the amalgamation of the traditional and digital worlds. In my video, the interactive work of Bugdanoglu exemplifies the new directions artists are exploring by playing with and combining media for the audience to literally play with. At Art Stage, art can be seen to explore and represent new possibilities of the future, capturing previously unthought of ideas and visions. It also brings together the actual and the virtual using technology to change our perception of the world. The future of art education must embrace technological advancements yet be true to its roots. In the presentation, I wanted to demonstrate how immersive art can be as an experience, the connection and symbiosis between artist and audience. Modern exhibitions demonstrate possible futures of art with audiences interacting with the creations. Singapore Art Science Museum brings together STEAM and a truly immersive experience (Figure 8). By interacting, you become part of the art. Similarly, a recent exhibition, Mirages et Miracles, shows the potential of AR to connect the artist and audience through a unique experience. It is exciting and challenging to imagine teaching and learning in this way. Innovation and risk-taking are embedded in possibility thinking and it is through questioning and exploring alternative futures that a relevant curriculum can be imagined. Of course, along with great innovation comes challenges. As Laura Cotterill pointed out in her feedback, “how can we keep up with such transitions in terms of educator’s knowledge and experiences with alternative forms of digital engagement tools?” This indeed is an issue for many schools, how do they chose which avenue to explore, which media to invest time, money and resources in and when and how do educators become proficient in these new skills? Robinson recognised that schools need to ensure subjects are useful for work. As the skills required for existing jobs change, schools need to place more value on creativity: creativity to develop a changing workforce that will be needed in the future to develop innovative solutions far more relevant than academic success. Creativity is no longer only for the young or artistic. Mitch Resnick reinforces Robinson’s reflection on the importance of this fundamental skill for the future workforce, suggesting that adults and children alike should focus more on “imagining, creating, playing, sharing, and reflecting, just as children do in traditional kindergartens” (Resnick, 2017). Robinson urges us to use our “gift of human imagination” and to build on this capacity in our students “to educate their whole being so they can face this future” (Robinson, 2006). Boden, M. A. (2005). The creative mind: Myths and mechanisms. Routledge. Craft, A. (2011). Creativity and education futures: Learning in a digital age. Trentham. Craft, A., Chappell, K., Cremin, T., & Jeffrey, B. (2015). Creativity, education and society. Institute of Education Press, University College. Csikszentmihalyi, M. (2015). Creativity: The psychology of discovery and invention. Harper Perennial Modern Classics. Feldman, D. H., Mihály, C., & Gardner, H. (1994). Changing the world: A framework for the study of creativity. Praeger. Resnick, M., & Robinson, K. (2017). Lifelong kindergarten: Cultivating creativity through projects, passion, peers, and play. The MIT Press. In the future, George Orwell imagined that there would be telescreens, speakwrite and printed postcards, much like computers, CCTV cameras and emails of today (Orwell, 1949). In 1985, Back to the Future predicted flying cars, hoverboards, fingerprint recognition and wearable technology. In Dave Eggers’ book “The Circle”, he described data sharing, public transparency and the ultimate connectivity through responsive wearables and smart objects. More recently in Ernest Cline’s book “Ready Player One”, we see students attend virtual schools as avatars in a dystopian world via VR headsets. How accurate and relevant are these “predictions” and are they more fiction than reality? Examining the Horizon report helps us to see what technologies already exist and which possibilities are just around the corner. Through its report, we can ascertain the necessary steps schools will need to take and investigate how to prepare our students for a future world we cannot yet know. Traditionally the purpose of school has been about academic success. Conversely, schools like UWCSEA have developed a holistic programme, but academics are still the focus and grades remain important when transitioning from High School to University. But do academics prepare our students for survival in the future world? What is authentic learning and a relevant education in 2018? Ken Robinson argues that “creativity, innovative and interpersonal skills and social sensitivity” are the fundamental skills needed (Robinson, 2017). There is never a more relevant time for changing the way students learn with so much technology at their fingertips. As the world of connectivity evolves and the need for innovative and creative entrepreneurs are ever more required, schools need to change. Out with the prescribed curriculum, standardised tests and end terminal examinations and in with digital literacies, multimodality and collaborative learning. Robinson talks about the past when practical and vocational subjects taught the skills that were needed for the workforce (Robinson, 2017). What skills are needed for our emerging world? Creative thinking and innovation have often been under-supported, but they couldn’t be more needed to help solve world problems in our ever growing planet and overwhelmed environment and infrastructure. But as technology threatens to take over our every chore, we need to educate students on surviving the pressures of today with strategies to cope with distractions and peer pressure, safety online and digital citizenship. There is a demand for digital fluencies (Crockett and Churches, 2017) to be compulsory within education norms. Web literacy is a basic skill when reading, writing and participating on the internet. Students need to be taught how to navigate, participate and to synthesize information in order to make sense of it and apply it. It is no longer enough to be solely an acquirer of knowledge; one needs to participate to learn effectively in today’s connected society (Sfard, 1998). But along with this comes pressure and they need to be helped in finding balance and develop strategies through positive role models. By humanising education through personalised learning the rewards will be empowered and intrinsically motivated individuals. As one reads the most recent Horizon Report, there are trends of technology in education that continue to feature in their ongoing research. Digital literacy, personalised learning and deep learning have been core areas of study over the past 5 years. More recently the popularity of STEAM, coding, learning spaces and virtual reality have been investigated. (Freeman, Adams Becket, Cummins, Davis & Hall Giesinger, 2017). Many schools have introduced coding for learning across their curriculum and Makerspaces support the rise of STEAM to reflect the skills needed for the world in which we live now. Schools are responding to the changing curriculum by looking at how to incorporate digital tools effectively within the existing learning environment. Mobile technology aids this transition, with tablets and phones but with this comes distraction and information overload. Gamification is not a new learning theory and gamified approaches have long since featured in a teacher’s toolkit. Spurred on by Jane McGonigal’s TED talk, “Gaming can make a better World”, wider understanding and acceptance of the power of games and game-based learning led to the development of apps like Quizlet and Duolingo where learning is personalised and adaptable both in the classroom and at home. The popularity of learning through YouTube over the past 10 years or more has enabled the medium of video to become a hive of activity for both consumers and creators. Individuals have become more open to direct their own learning and as a result online courses through EdX, Coursera, Udemy or MOOCs, have risen in popularity. My own experience of online engagement courses has been motivational, as I can choose a course which meets my needs at a time that best suits me. Practices of flipping classrooms and using videos within apps like Edpuzzle are becoming more usual practices. Similarly, teacher-monitored study sites and mobile apps like MyiMaths, Quizlet and Doddle help integrate person-centred learning opportunities alongside traditional teaching methods. Personalised learning has to be key in the future, where individual needs are understood and digital tools are chosen to improve differentiation. Students will need to become more self-directed learners in order to be motivated to drive their own learning and upskilled for the world of tomorrow. In the Horizon report, virtual reality (VR) features heavily as emerging technology for schools. But “it will take a few years before VR becomes vital to schools around the world.” (Freeman et al., 2017, p.46). As an example of experiential learning, VR has much potential to help students understand and immerse themselves in an environment, situation or place. Google Expeditions has been successful in classrooms as a cheap and simple option when starting out with immersive technology. Being able to step into another world and experience life in another culture or underwater brings the unreachable into the classroom. Simulations prove fun and engaging and this aspect of VR is seen as a potential direction for schools. Relevant world experiences, whether real or virtual, engage and help deeper and authentic learning. In Michael Bodekaer’s TED demonstration of a virtual science lab, he explains how important the education of today’s generations of scientists is in solving world issues such as population growth, health and the environment. He sees immersive technology as a tool to engage and understand difficult concepts and situations to reimagine learning as we know it (Bodekaer, 2015). Apps like Google’s Tilt Brush take VR to the next level. The possibilities are endless but, as it is still in its infancy, we are, as yet, limited in the examples of schools successfully integrating VR into the classroom. The next 12 months will be crucial in changing this shift, as technology evolves and becomes more viable economically and practically. With the increasing advancements in technology, there is a growing need to embed the teaching of digital fluencies. Linked to this, in his book “Creative Schools”, Robinson says that we should be teaching students 8 core competencies: curiosity, creativity, criticism, communication, collaboration, compassion, composure and citizenship (Robinson, 2015). To be able to critically question, develop innovative ideas and solve complex problems are crucial skills that build students capabilities to live and work in a future world. As schools change and adapt so must teachers themselves will need to keep abreast of these new literacies. With these competencies in mind, Director of IT at UWCSEA, Ben Morgan, says schools need to focus on what is needed right now and the relevant technologies that can help us to learn most efficiently. He says that he sees “great examples of using technology all over the College, but what I would love is for the best of that to be in use everywhere” (B. Morgan, personal communication, January 20, 2018). An example of this is the use of Teamie, an online learning platform, used for discussion, sharing of resources, feedback and ongoing formative assessment. If all teachers employed it consistently, then all students would use it effectively, resulting in deeper learning. Only then should we move on to other emerging practices and tools that support learning and enhance digital literacy. Digital fluency has never been more important and, rather than continuing to chase the next best thing, schools should focus on what is the right technology for their students and fully embed it in the curriculum. With advancement comes balance. As students live increasingly sedentary lives, the importance of play and spending time outside will become even more important. The benefits of play are clear in early years but also for older children: play builds skills in collaboration, tolerance and persistence and the Lego Learning Institute cites play as “an essential ingredient to fuel creativity and capacity as learners” (Whitebread, Ackermann, Gauntlett, Wolbers, Weckstrom, 2012). Whilst online communities and gaming sites allow for collaboration and communication, face to face interactions are still a crucial part of developing relationships. Whitebread talks about the risks attached to play deprivation and how “children’s cognitive development and emotional well-being” is related to the quality of play. When play is taken away or reduced, so too does cognitive functioning and social and emotional development (Whitebread et al., 2012). Bringing play back to the classroom will bring benefits as well as balance. Schools need to change to be relevant. By focussing on a culture of innovation, deeper learning will follow (Freeman et al., 2017). In “Different schools for a Different World”, Scott Mcleod and Dean Shareski talk about the big shifts in deeper learning schools and innovative organisations. These are: changing thinking approaches to school; higher level thinking such as creativity, innovation and problem solving; student agency including personalisation and differentiation; authentic work; technology infusion such as global connections and online environments; and “robust tech integration” (McLeod and Shareski, 2018). They cite schools that are fostering deeper learning including High School High, Surrey Academy of Innovative Learning and New Tech High with projects incorporating communication, collaboration, critical thinking and technical proficiency alongside relevant, real-world situations and in flexible learning environments. (McLeod and Shareski, 2018). With rapid advances in technology, concerns must be raised of the digital divide. How do we lessen this gap whilst technology advances so rapidly? How do children in impoverished areas develop these skills? Is the divide between the rich and poor widening with regard to digital literacy? When will access to technology be free and available to all, so that consumers can become creators no matter their culture, status, age or upbringing? How could schools and communities help towards digital inclusion? With the dawn of a new era of modern media, who will be left behind to widen the gap even further? Should it not be a human right to have access to modern technology. Eggers , D. (2013). The Circle: A Novel. New York, NY: Alfred A. Knopf. Orwell, G. (1949). Nineteen Eighty-Four. McLeod, S., & Shareski, D. (2018). Different schools for a different world. Solution Tree Press, a division of Solution Tree. In order to keep up with these digital natives, we must understand where they are at, keep the channels of conversation open and reconsider social media’s place in education. There are pros and cons for the use of social media and its place in education, particularly that of tweens is a hard fought debate. School aim to educate youngsters to fit in and thrive in society and, in order to fully understand the implications of social media’s place in the classroom, we must investigate how it operates in our world and what good it can bring to our children. I first became aware of social media when I had left the UK and was working in an International school in Italy. Far from home, with a young family, we learnt to use a webcam to connect to our nearest and dearest. Teaching our parents how to use one remotely was the toughest part! Soon after moving I joined Facebook (2007) and later in 2009, Twitter. Prior to this, I do remember having Friendsreunited to reconnect with old school friends and a myspace account, but I cannot recall how long ago or if I really used the latter much: as with most of us, Facebook took over fairly quickly and overrode all other platforms. Social media did exactly what it said on the tin and it became the place to be social and talk with friends and family when living abroad. I could share messages and photos and see what they were up to. At first, I didn’t quite understand Twitter: it seemed I was tweeting to an empty audience and I wasn’t quite sure of the point. But later, in 2011 following the Learning2 conference in Shanghai, I followed advice and started to follow a list of recommended educators. Following others, watching from a distance, “lurking”, and learning from them helps us to understand the protocols and processes of a new media. It also leads to new connections and ideas. That is the thing about Twitter: it is full of wonderful people and ideas, links to articles, videos and others creations. Of course, we have to filter out and ignore the rubbish and outrageous tweets, sift through the fake news and find what it is we are interested in. Having become a converted fan of Twitter, microblogging led to “proper” blogging. Finding an audience became my first fear – would I have anything interesting to say, would anyone want to read it and then what? What was it for? Blogging should have a purpose but be authentic to the individual. It should be a place to freely express oneself and this can be valuable when reflecting on a course, conference or weekly updates or shares. My first task, back in 2014, was finding other art teachers who blogged. As the COETAIL course evolved, we were encouraged to comment frequently on other cohort member’s posts, much like MA TCT, and develop closer connections. Creating authentic connections and developing genuine friendships virtually was an important part of the course. We live in a connected global classroom where anyone can stumble on your words and offer opinions and ideas. Building a PLN, a tribe, was a crucial element in developing dialogue. And this is why integrating digital literacies should be fundamental in every school curriculum: literacies like reading, interpreting, decoding, analysing and sifting for truth. In Anne Longfield’s worrying report “Life in Likes” the children’s commissioner for England says children hit a “cliff edge” when starting secondary school and asks why aren’t we “preparing them for the pressures of social media?” (cited by M Browne, 2018). Helping students to successfully navigate the complexities of being social in this digital world means helping them to understand more about who they are, their values and wellbeing. Similarly, Huay Lit Woo and Qiyun Wang investigated the affordances of “weblogs” in developing critical thinking. Constructing a blog post requires research and analytical skills, referencing and organisation as well as writing and appropriate accreditation. 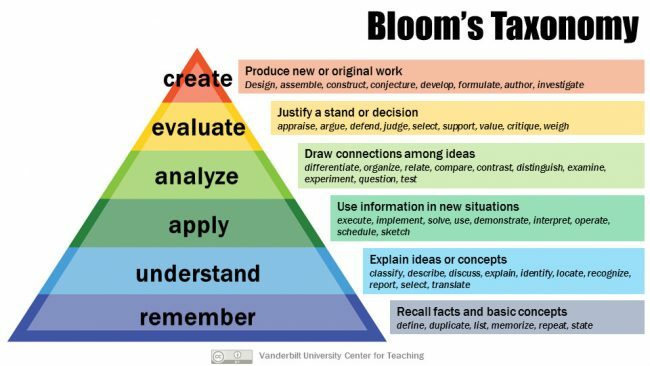 Problem-solving, creating engaging content and synthesising ideas are higher order thinking, at the top of Bloom’s taxonomy. Silvia Tolisano equates a successful class blog to the upper levels of Dr Ruben Puetredura’s SAMR model. She shares that it can redefine learning by being a “central hub” where students and teachers share and create, connecting, communicating and collaborating with the wider world. (S Tolisano, 2014) Another of the key affordances of a blog is that the writer has an audience and that viewers can interact with the writer through commenting. (Woo and Wang, 2009). Building conversation, developing arguments and cultivating opinions, in and out of the classroom are all valuable life skills we should help our students to hone. Within a class, how often do students authentically interact with each other offering valued feedback and advice? How often do all voices, including the introverts, get heard? Offering opportunities to share opinions, reflect and ideas can open the channels of conversation, connect like-minded individuals and build a supportive community. Supporting our students and encouraging them to create genuine connections online is an ideal opportunity to support their wellbeing. Modelling and sharing experiences with Twitter or Instagram class accounts, and following specific hashtags are simple ways to start out, but also teaching safety and awareness of privacy. The media is littered with examples of adults and high profile individuals behaving badly online on Twitter and these can serve as learning opportunities in digital citizenship. According to Piaget’s theory of constructivism, we build knowledge based on our experiences, (Piaget, 1976) and digital opportunities of connecting and collaborating online offer new ways to understand and make meaning. Moreover, Vygotsky repeats the importance of social interaction in the development of an individual. His theory on the zone of proximal development presupposes that an individual will develop alongside a more advanced. (Vygotsky, 1978) But is this true when connecting online? Is it the interactive and collaborative nature that social media affords that help to develop the skills in our students? Developing as an individual through connectivism is also true for adults. A small group of teachers in Singapore, piloted by a colleague, Tricia Friedman networked through individual monthly blogs to connect and start discussions around shared ideas and articles. It soon grew to include teachers further afield and, following this success, I am planning a new kind of connected and social play online with a Sketchbook challenge, digitally inspired but traditionally produced. These shared experiences will be literally passed around physically and virtually, connecting like-minded educators to share their ideas and thoughts visually and learn from one another. Blogging for the MA TCT has pushed my own research, critical thinking and analytical skills. Being put back in the shoes of a learner, navigating my way through multiple readings and slowly and surely finding my own research route through past and present theories and ideas has been eye opening. It takes time to develop an authentic voice and courage to post publicly. I am developing deeper thinking, yet I would like to connect and encourage more authentic dialogue with the rest of the course participants. How can we do this more seamlessly, transparently and easily alongside our busy teaching lives? Could microblogging be a possibility or could we as a group work in smaller more focused clusters, much like quadblogging, to give meaningful feedback and create community? YouTube is students go-to community to learn a new skill or find how to do something. This has been the case for many years and video has become a popular tool for gamers and musicians to share their work. Often adults assume teenagers to be watching mindless videos or consuming endless accounts of gaming adventures but there are many youngsters sharing meaningful creations that can inspire the next generation of creators. Bloggers like SoSonia with her unique style of video began sharing her creative ideas as a young teenager and now she is now working for SoulPancake, making positive, meaningful and uplifting media for the “optimistic millennial”. Livbits is a 10 year old social media ambassador, showing youngsters how sharing online can promote student voice and audience. Boblhead is the 14 year old son of a music teacher in Singapore, recording his own music, making films and selling his own designed merchandise. It is through inspiring examples like these that we can justify social media’s place in modern society and the more examples we can share the more our students will be inspired to create and share. Parents may still feel that social media doesn’t have a place in education, but it is where our youngsters play and learn. We should talk with them about what they do, who they listen to and learn from and how they use social media in their daily lives. Often it is assumed to be solely a playground, but through social media they are learning how to communicate, to behave and to create. With appropriate strategies, students need to be educated in the ethics of what they communicate, share and create online and their rights and the accompanying dangers. Recently, in the Times Educational Supplement, Jonathan Owen shares some newly published simplified guides to the terms and conditions of popular social media like Snapchat and WhatsApp. (Owen, 2017) With so many actively online, we must ensure they know what data and information are being gathered and shared. We need to show students how much more social media can be than just sharing an image and waiting for the obligatory amount of likes, retweets or streaks to signify popularity. They need to develop better habits of living healthy digital lives. As educators and parents, we must address teenagers’ vulnerabilities and talk more openly about student wellbeing when playing in such a potentially volatile yet mesmerising and ?? playground. What ways can you see social media positively impacting your students? How might you use blogging to push their critical thinking skills and enhance their digital literacies and citizenship? Homayoun, A. (2018). Social media wellness: Helping tweens and teens thrive in an unbalanced digital world. Corwin, a Sage Company. Ripp, P. (2017). Reimagining literacy through global collaboration. Solution Tree Press, a division of Solution Tree. Learning is complex, but being part of a community helps it to be fun, collaborative and engaging. My own learning is greatly enhanced by the connections I make and the conversations that happen as a result. So how can we help students to create, connect and communicate effectively and how can technology help? Conole and Dyke (2004) explain how collaborative spaces are most effective when the teacher has a clear vision for the use of and interaction with the space, so it is important that educators remain at the forefront of technology but with learning being the prime focus, not the app. Nearly 10 years ago Wallwisher was launched with the initial idea to wish your friends a message on their birthday wall. It was a carefree, simple space to post ideas much as you would stick Post Its on a poster to share thoughts. It was quick to connect and easy to use. You built a wall with a shareable link so others could add to it. Since 2012, rebranded as Padlet, it has much the same intention but with far more affordances. It is widely used in schools for sharing resources, generating ideas and feedback, for book reviews and as portfolios. Padlet is an online collaborative space to display ideas visually or to share information and communicate together. In its simplest terms, it is a digital pinboard on which to post thoughts and ideas on electronic sticky notes. It is a free app, accessible online or on mobile devices, making it an app of choice for many educators. It is easy to set up and versatile in its uses, and appropriate for all ages. You can find Padlets about using Padlet online to demonstrate the multitude of situations it can be used for. Setting up is simple and straightforward, connecting to your Google account, Facebook or email so that posts are personalised rather than anonymous. You can customise a wall (Padlet) to match your intentions, adding a specific URL for ease of sharing with your students and establish a format for the wall as a grid, stream, canvas or shelf. These can be changed at a later date should you wish although it is worth noting that shelves need a little bit more time to be set up and do not react well to change in format. What are the affordances of Padlet? Clearly, Padlet has many positives and negatives to consider. When we select a tool to use in the classroom we should choose it because it will enhance the learning. So how can Padlet be used in education? What makes Padlet such a popular app in schools? Padlet’s beauty is in its flexibility and it is the educator’s (or author’s) imagination that determines the way a Padlet could be used. Many teachers use it as a space to discuss, debate book reviews, to post resources or to share ideas. Padlet allows users to upload and share images, files, links, videos and audio, using the webcam to take photos. Each attachment loads and views easily. Its simplicity and intuitive use make it immediately usable in the classroom; share a link to the board and the learning starts. There is no need to explain or instruct in most situations, as long as the teacher has a clear vision for the task created. How can it be used to enhance student learning? I use Padlet in many contexts, but the most transformative has been using a class board to track individual progress during a unit of work. I set up a Padlet using the shelves format with student names at the top. Students can add posts as the unit progresses and see their peers’ work at the same time. I use the space to consider their organisation, offer feedback and track development and skills shown. It also serves as a space for students to reflect on their work. Padlet allows students to see other responses immediately and so they can interact with others’ posts, sharing feedback, ideas or comments. A new feature added recently is for participants to be able to react to posts. These reactions can be chosen before or during an activity and give the teacher the option for students to like, star, grade or vote up a post. This can be engaging for students, especially in today’s “like” society, but care needs to be taken when selecting this option and having a clear rationale for their use and timing. Other ways Padlet is used in my school, are for book reviews and recommended reading, curating resources, visible thinking routines and sharing essays as podcasts for critical feedback. There are many ideas online on innovative ways to use Padlet. One of the most extensive by Anissa Labrador documents 100 ways to use Padlet. In Middle School, Angie Erikson asks students to upload audio recordings of their personal essays to a private Padlet, much like a podcast, to connect the listener to the individual. In turn, they provide critical feedback to guide the writer in refining their work. Lipponen (2004), explains that collaboration is important for peer interactions and shared learning. Computer-supported collaborative learning (CSCL) assists learning through social interaction. Encouraging students to engage with the technology, to interact and create new learning builds these necessary 21st-century skills including collaboration, problem-solving and communication. Through active participation, Lipponen states that it is not only knowledge that is constructed but skills that develop the identity and future actions of an individual. Knowledge and learning are distinct entities with learning denoted by a change or advance in understanding. How can Padlet assist with this? Andrew McCarthy, in IB Economics, uses Padlet to help students to sort information and resources working collaboratively to construct new learning with the materials and information discussed in class, setting up columns to guide students. David White, an IB English teacher, shares a blank Padlet for students to build their interpretations and comments on literature chapter by chapter thus creating a wide resource of views and ideas across the participants, sharing quotes, thinking and learning collectively to broaden preconceptions and knowledge. By clicking the wheel you can see which skills are used in a particular activity. In addition to assisting in knowledge creation, shared understanding and collaborative feedback, Padlet also affords us with the ability to see interactions, connections and visuals. The canvas format, as seen in the screenshot below, allows students to connect to others’ ideas in real time, expanding their thinking, much like a mind map but collaborative on a large scale. Of course, unless directed and set up appropriately this can be overwhelming and difficult to comprehend, as the example in the video below shows. A slight adjustment to the setup and organisation of both task and class channels thinking more clearly and understandable to participants. Harvard’s Visible Thinking encourages active participation to allow individual and group thoughts to be seen and accountable, debatable and therefore learning tangible. David Perkins (Project Zero, HGSE) asks whether students frequently ask questions, debate information and share ideas and understandings in our classrooms. Conversations and thoughts are lost and forgotten as time passes so how do we make this thinking visible? Padlet can document and visualise student thinking and become a space for learning to be revisited and reconstructed over time. Padlet allows students to participate individually and collaborate as part of a group: activities crucial to learning and knowledge building. (Lipponen, CSCL). Similarly, Flipgrid allows students to build a thread of feedback and information depending on the task set. Through video, participants can respond to one another at different times and locations to connect and debate thinking and build understanding. Whilst Flipgrid engages individuals, not every student is comfortable seeing their face or hearing their voice publically, so Padlet allows the introvert or camera-shy individual the choice of a participatory method when interacting on a board. Over time students become creators of their learning not just consumers of knowledge, collecting and sorting information, ideas and resources on boards they set up. To survive and thrive in the 21st-century students need to develop their higher order thinking (Bloom, 1956) and in particular skills in analysis, evaluation and synthesis. CSCL helps students to connect and share their learning more visibly through spaces such as Padlet and in turn build these vital skills in a supportive and responsive environment. How could you use Padlet in your classroom? Please share your uses and ideas in the comments below. You can watch my Padlet review below which includes many more examples and guidance in setting up and collaborating. Strijbos, J., Kirschner, P. A., & Martens, R. (2004). What we know about CSCL and implementing it in higher education. Kluwer Academic Publishers. Tankersley, K. (2005). Literacy strategies for grades 4-12: Reinforcing the threads of reading. Assoc. for Supervision and Curriculum Development. If you had 1 day a week to do what you like and to be creative what would you do? What about 1 hour or even 20 minutes each week? Students at UWCSEA in a Grade 6 advisory group every Friday are engrossed in planning something creative, something fun and above all self-driven. So how do we structure the time to best help our students delve into their area of choice? How can we make the best use of the resources and time to authentically investigate and make? Jacqui Benson is a Middle School Maths teacher, a creative thinker and enthusiastic maker. With an underused facility open to students during the school day, an ideal opportunity dawned on her and she shared this with her new 22 x 11 year olds during the first few weeks of term. Hearing about this I was keen to join in and, having read Spencer and Juliani’s book Empower over the summer, the opportunity to truly empower students with choice seemed perfectly timed. A moving car, robots, sewing, LittleBits, and banning plastics. These are just a taster of the projects our group are investigating each Friday morning. Further down the school, iTime is a part of their working week, where primary students visit the Ideas Hub with their class teacher weekly to work on all sorts of creative projects. But, as students get older and move into Middle or High School, these creative personal projects dwindle and, for some, sadly disappear altogether. I have so many students (and adults) tell me they cannot draw, that they are not creative and don’t know where to start when given a problem to think about or solve. Yet creativity, critical thinking and problem-solving are at the top of the skills needed, according to World Economic Forum, to thrive in the fourth industrial revolution. Having been a teacher for over 20 years, and valuing creativity above all other skills, I was excited to now see creativity and thinking at the top of the necessary skills for the future. Our roles as teachers must be to equip our students for this and it is all of our responsibilities, not just the art, drama and music departments. Thinking is involved in all subjects and in walks of lives, yet often an undervalued and tapped into skill. Being able to think and work creatively should be an integral part of school life. Having trained as a graphic designer the Design Cycle is a natural workflow for me and it mirrors the way our minds need to work when solving a problem. There are a multitude of methods, visuals and instructions for the creative process out there, from Spencer and Juliani’s Launch Cycle to Tiffany Shlain‘s 10 stage video, but the language and the sentiment are the same and always about generating lots of ideas. Often students (and adults) say they are not so good at this. They become fixated with a single solution and don’t allow themselves to wander into other possibilities. 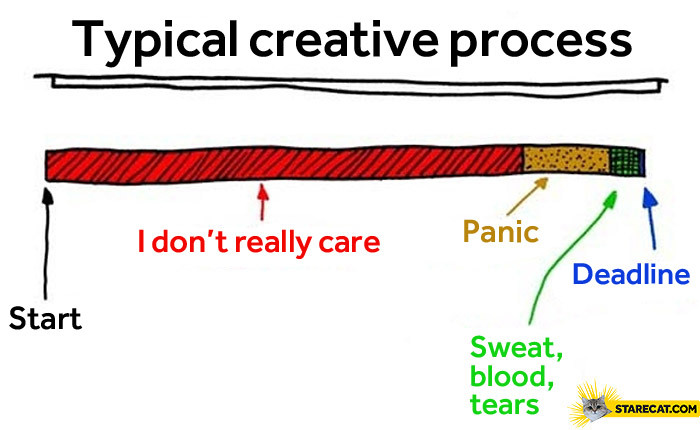 This is where creativity happens. Those what if and aha moments. You have to fail or at least produce bad ideas in order to take a new direction and then ultimately the good, and even great ideas follow. But youngsters need help in getting there. In the Hub, we are adopting a streamlined version of Juliani’s Genius Hour Blueprint. Genius Hour (aka 20% time, iTime or Passion projects) originated from the concept of 80:20 time used to investigate ideas not pursued in the normal working week. It became a time for individual creativity to flourish and for great ideas to blossom. From Google’s introduction in the workplace to personalised education and project-based learning, it engages and empowers individuals. What do you like to do? What have you seen that intrigues you? What are you drawn to? What are they doing over there? What is your passion? I am always thrown when I ask students what is your passion. Often they do not know how to answer this as they may not have one. It takes time to figure out what they want to do and sometimes they just need time to play to see investigating what there is and what might be interesting to them. Two girls wanted to continue their Grade 5 Expo project about banning plastic bags and were starting with a petition. I asked them, what do you want to achieve? What will success look like? Then what? They hadn’t thought much further than their original project and just wanted the time to continue it. This was fine, but I wanted to push them more creatively. I wanted them to think what difference they could make and what they thought that might look like in the context of our school, the community and beyond. It will be interesting to see how far they travel from their original plan. In the second session, we introduced the group to the next phase following their initial investigations. The second phase in our revised structure is, for me the most exciting. Anticipating what different ideas these boys and girls have in their 30-second elevator pitch, I just can’t wait! Some will be very clear as to their idea, others very unclear, but, come next Friday we will hear them all, then open the floor to questions. This is an important phase as it can help the struggling ones to clarify their thinking and, for the fixated, blinkered ones, open their idea to other possibilities and directions. We aim to do this through a circle solutions approach with a follow-up on Padlet to pose and answer questions, and, if you like, with the permission of the class I will post the link here as an update next week. Please feel free to jump in and comment. I expect they will be secretly thrilled to have an outsider interested in their project at this early stage! Having clarified their idea it will be on to the main event: planning, more playing, experimenting, making, creating. Often creativity can be quite messy, figuratively or literally! But it always starts and ends up somewhere different, occasionally quite the opposite from where you originally thought. and that is the wonderful thing about the creative mind, how geniuses and, in particular, how young learners work – they don’t restrict their thinking or preempt the result. But even as young as 11, this utterly free thinking is all but over; the active imagination is closing down. Why is this? Why do we lose that wonderful freedom of imagination of a kindergartener? Do we lose it naturally as a part of life and growing up or do we stop using it or stretching it, like a muscle in sport, as the curriculum takes over? Whether young or old, we all need to find time and space to work our creative mind, to activate our imagination and to allow bad and plain mad ideas to foster and grow. If you haven’t seen Elizabeth Perry’s Learning 2 talk “Play on” about her 10 minutes a day drawing practice, do watch it, and if you have, watch it again as it is a wonderful example of an adult’s journey into creativity and exercising the brain. It is also a great story of failing not failure (Spencer & Juliani, Empower) and about grit to deal with mistakes as bumps on the road of discovery. As for me, I have too many passions, too many projects and too many ideas. But, if I were to choose one, it would be to do the opposite: To practice meditation, to clear my mind in order to be more open to alternative possibilities. To anyone who knows me this will be a difficult task. I have always been blessed with having a creative mind with tons of ideas (often too many) and to try to have a clear mind with no thoughts seems impossible! But we all need to switch off occasionally, and it was whilst having my hair washed yesterday at the hair salon, that I found, just like in meditation (and often in the shower!) as my mind cleared and I relaxed, I then had my best ideas, genius thoughts and creative possibilities. I had to concentrate really hard to remember them as the shampoo was washed away, not wanting my ideas to do the same! So, as I returned to the chair, excited with my brain’s activity under calmness, I quickly jotted them into my sketchbook. What do you do to be more creative, to activate your imagination? What would your Passion Project be? It’s the start of the year, with new routines, rosters and rotas. With the new term comes new students fresh from Primary School and raring to get into the Art room at the end of a busy day of listening, learning and hopefully a lot of laughter. I want my room to be a refuge, a rare oasis of calm and happiness and above all a place they feel safe. I want to get to know them, all 247 of them, especially the ones I have taught before yet never truly got to know well. How does one get to really know another? The first week meeting my students is also tainted with some sadness as I say a tearful goodbye to my eldest son, who departs for University back in the UK. It is with heavy hearts that, as parents, we have to finally let go and allow them to fly with their own wings, when really we just want to hold on to them for a little (or a lot) while longer. Do I know him well enough to know he will be happy, healthy and ready to embark on a new adventure 1000s of miles away? Do we know anyone truly? I first watched The Lab: Decoy last year and was intrigued by the concept. One man, 6 photographers, 6 perspectives. It is fascinating to see, not only the skill and sensitivity of each photographer but how much the story influenced their portrayal. Art expresses the heart and the none better than the medium of photography to capture more than just what someone looks like. Each photograph reveals some of the characters of a person through pose, position or emotion. Each photographer puts some of their own feelings and beliefs into their final chosen composition. My favourite part of the fascinating video is by far the grand reveal and the comment by the actor, “it almost looks like 6 different people”. How do people see you? How would you wish to be photographed? What story would you tell to help someone get to know you better? How do you portray someone through photography? As we embark on a digital photography project with Grade 7, their first task was to capture their partner and design a poster if they were running for student council. As they got underway, I overheard similar conversations to the video as students checked in with their partner as to how they felt they should be portrayed. Perhaps this is my first glimpse of them, not just as a person, but as a photographer. How do we do that? How can art or photography capture the real person? Think about when you have met someone for the first time. How often do we judge someone by their name, looks or first impressions? Do first impressions really count? If this were true, some initial impressions of me might be that I am too quietly spoken, therefore shy or unconfident. They might notice that I am a good listener, so I am interested in them. But how much do we give away on a first meeting? When do you reveal your true identity, warts and all? When do I reveal that I am a tech geek, chocoholic, football widow and an introvert with wannabe extrovert tendencies? When do I share that I love being around people but also need peaceful time alone? Introverts are perhaps the least well-known individuals and there will be introverts in your class – some obvious to you, some not. How do you sense them, how can you engage them, and how can you support them? As I scan my 11 classes online, searching for any clues as to their inner personalities, one click takes me to their medical information, learning issues, contacts, siblings and previous attendance. But I don’t see what excites them, scares them, what their favourite sport, TV show or food is. I can’t access what their dreams for the future are or how many pets they have. I can’t tell if they love my subject or loathe the very thought of putting paint on a paper or drawing a plant. I can only guess their story. On the first day, Middle School teachers we were asked to write a short blurb, an introduction about ourselves, for students to gather together a picture of their teachers for their parents in the initial weeks of term – but what about their blurb, their story? I wish I had asked them to write to me about what they would like me to know about them, much as a Primary teacher might ask students to send a postcard introducing themselves during their holiday. I wish I had the time to chat with each and every one about their likes/dislikes, life at home and away and to see where we cross paths and interests. Will I judge them by their first artistic creation, or by their ability to complete the homework creatively and on time? What will I learn about them from their questions, their answers or their silence? Could blogging allow their voices and their idiosyncrasies to unfold? I have only one lesson a week with all these individuals – how can I use the time wisely to get to know them better? How will you be getting to know your students better this year? Postscript: Like to get to know you well was a hit back in 1985 from the fabulous Howard Jones, who is still creating, performing and sharing his passion today. I dearly loved his words, sentiments and hair, and I continue to follow his changing style and endless innovation in music and technology today. First there was the Industrial Revolution in the late 18th century with the mechanisation of the textile industry. Then, the second industrial revolution of the early 20th century leading to increased mass production and in the 1980’s the Digital Revolution was well underway, changing industry again. So what’s next? Are we about to have a new revolution or is it staring us in the face? Could this be the Age of Creativity? In Australia, over 50 creative subjects have lost funding for student loans including jewellery, circus and art therapy (Student loans cut to creative courses, Richard Watts, ArtsHub, 10 October 2016). So instead of supporting and promoting more time and resources to creativity it appears to be quite the opposite. Why is creativity so important to our future? For over 20 years I have been promoting the benefits of the Arts and how the skills involved in our subjects go beyond simply being able to paint, draw, sing or dance. It genuinely upsets me that students, at aged 14, can all but give up any form of creativity as they enter GCSEs. Even Group 6 of the IB Diploma is optional, where students do not have to choose a creative subject and can opt for another science or language for example. In my short video, prepared as a proposal for an ADE showcase on creative thinking, I highlight the growing trend away from creativity further up the school and how this skill is such an important life skill. A skill needed for a world that is rapidly changing, for jobs which we do not yet know and the obvious need for innovative and creative thinkers. Being creative is not about being artistic, dramatic or musically minded. It is about thinking differently. Creative thinking is a skill that must be encouraged and taught through opportunities in every subject. In order to develop this essential skill Prendergast says we should “build community and a culture around creativity”. So what does this look like in your school? What exists already to encourage and cultivate a culture of creativity? How can we encourage creativity? In Primary school, play forms a crucial role in allowing students the time and space to freely experiment, invent, fail and succeed. The Kindergarten approach allows learners to develop as creative thinkers for a world that is changing more rapidly than ever – the need to be creative is imperative in order to come up with innovative ideas for solutions we don’t not know about yet. “We need to develop innovative solutions to unexpected problems that will arise” (Mitchel Resnick, MIT). In the same way that Kindergarteners learn, we need to continue this approach throughout our lifetime: experimenting, inventing, failing and succeeding. There is a genuine need to tinker and play in order to develop creativity. In my previous post about Play, I talked about the need for students and adults alike to be more playful, to problem solve and thus more creative. But what about higher up the school? How can all subjects integrate elements of creativity alongside their content? In the revised Bloom’s Taxonomy, CREATE appears at the top, upgrading “synthesis” and leapfrogging “evaluating”, for we know that, in order to create we must thoroughly evaluate first. How do different curriculum areas incorporate this higher order thinking? What do you do to promote creativity? Not only were students developing their Learner Profile attributes, PYP attitudes and ATL skills, but there was also rich, authentic engagement with literacy, math, humanities and science! Whether you are interested in STEAM projects or just want to help develop curious and creative individuals, there is compelling evidence for teaching innovation and creativity. Pete O Mara, in the Times Herald article on May 17th, 2017, states that “developing the creative mind has never been more important“. Why are schools and parents paying more attention to grades and assessments and such little emphasis on creativity and imagination? Being specific about what your task or goal is will help focus your ideas. Too many options can be overwhelming so limit these so you can develop better ideas. Narrowing your focus can lead to greater creativity. Self belief plays a huge part in being more creative as it does in many walks of life. Believing you can improve is the first step. By rejecting bad ideas you may be preventing a good idea forming. By accepting bad ideas are just ideas you might be able to combine them to produce a good idea. I’ll leave the last word to John Spencer on how creativity is tough. It is tough but worth it. When we use the word play it conjures up lost days as a child making sandcastles on the beach or tents from sheets on a rainy day. It reminds me of free time, unrestrained joy and creative interludes in the drudgery of normal life. Play means fun. If I use the word in the classroom, the atmosphere changes; students are more free with their experimenting without boundaries and restrictions. But often they don’t know what to do; they have forgotten how to play in a learning context. My students are Middle School but I am sure that High School students are the same. So, when did they forget how to play when learning? Teenagers play all the time when learning a new video game, trying things out, failing, trying again, but they don’t equate the same when at school. Being playful appears to stop at Middle School, perhaps as they may look foolish in front of their peers, are fearful of making mistakes or maybe they just think they are too old for play any more having transitioned from Primary School. As for adults; we play even less when learning something new. So who told us to stop playing? to engage in activity for enjoyment and recreation rather than a serious or practical purpose. Play is a fundamental part of Kindergarten or pre-school, taking up much of these youngster’s day. Play is important to build imagination, collaboration and friendships and they are “developing their language, math, and social-interaction skills.” (Osei Ntiamoah, The Joyful, Illiterate Kindergarteners of Finland, October 1st 2015). Further more, according to her research study The Power of Play, “in the short and long term, play benefits cognitive, social, emotional, and physical development…When play is fun and child-directed, children are motivated to engage in opportunities to learn”. But is play just for the young learners? There is nothing more satisfying than playing with a lump of clay, plasticine or play-doh. At any age, the feel of the soft dough (and the smell) brings back memories of childhood and a uncontrolled time of wondrous abandonment! As an art teacher, my classes go quiet when clay is out and students would genuinely choose this medium above all others! But clay work higher up the school is far less used and painting, drawing and photography dominate our exhibitions every year. Other sculptural media feature but less so ceramics. Is this due to their fear of failure or just that we don’t allow them to play enough once past Primary school? So how can we bring back fearless play and incorporate Play-doh into other curriculum areas? We remember when we engage. Elizabeth Perry, in her recent talk “Play On” at the Learning 2 conference in Warsaw, Poland, reminds us that almost all creativity involves purposeful play. She talks us through her own experiences of new learning and how she nearly gave up when faced with a failed drawing. You can read more on the creative exploits and daily drawings of Elizabeth at her blog, Wool Gathering. When trying out something new, play offers no boundaries and no assessment, allowing us the freedom to experiment to learn. There is an inherent need for play in us all, whether just to let off steam, as an antidote to our stressful lives or as genuine therapy. We get lost in play and stop thinking. Popping up in the UK are adult soft play nightclubs. The first, in Birmingham at Amusement 13, hosted a “Regression Session”, with bouncy castle, a lego lounge and ball pits and BallieBallerson, in London, boasts 250,000 clear glow-in the dark balls in its adults-only ball pit bar, pulsing away to the music! That’s it! I’m off to bounce away my Monday blues- care to join me? Some of the most popular buys on Amazon this Christmas were adult colouring books and board games. In our busy and technology driven lives these retro tools give us a well earned breather and a step back into how it used to be before were were permanently connected. Don’t get me wrong, I love my devices but we need to strike a balance and games, books and even jigsaw puzzles are a nod back to the days of calm and uninterrupted focused, unstructured play. But is it just a fad or a need for nostalgia? What sort of play do you remember and what do you think of digital vs traditional methods of play? Just this week, I attended the local ADE meet up where we were invited to play around with the relatively new tool Apple Clips on our phones. We were challenged to tell a story using simple images and video clips including natural, outdoor and close up shots as well as selecting from some quotes to include. We had 20 minutes to collaborate with other ADEs, have fun and learn the tool. Chaos and laughter ensued. The results were hilarious, clever and downright silly (ours) but it took this unstructured play to let us loose with our creativity and get to grips with the app. Needless to say we will all be looking for ways to include it in our classes as a result. This week I decided to commit to being more playful as a result of this post. I invite you to look at the 100 Day project, which originated in New Zealand or follow the posts on Instagram. Participants sign up online (this year’s starts on May 22nd) and commit to posting one creative thing every day for 100 days. Beck, an art teacher colleague, and I decided to both participate so we can encourage each other and track our creativity over time, much like how Elizabeth first started her daily 10 minute drawings. Watch this space for the final (100) artworks. What would you choose to do creatively daily for 100 days? What would you like to pursue to bring back the child like playfulness in you? What ways can you bring play into your classroom? Today’s classroom is a far cry from when I started teaching back in the 1990’s. Nowadays, schools may have a 1:1 laptop programme, BYOD, a suite of static computers or trolleys of iPads to use. Students communicate via online learning platforms, such as Edmodo or Teamie, write and submit assignments via Google docs and create a plethora of ideas using devices or applications. Technology is evolving at an astonishing rate and educators are responsible for students ever-changing skills as a result. What does it mean to be literate in today’s technology-driven education? What are the necessary skills needed to navigate, communicate and create? When we consider being literate we think about being able to read and write. According to the dictionary, being literate is to have “education or knowledge, typically in a specified area” (Oxford Dictionaries, n.d). Being able to read and write has always been a basic requirement to understand the world around and the standing block of Primary education. But the world around has changed and, in the 21st century, being able to understand and navigate the digital world is becoming a necessity. To be able to interact and communicate; to read, interpret and dissect information; to connect and collaborate online and to be able to trust and research what is real and what is not are skills today’s students need to be taught. Marc Prensky described Millenials as “Digital natives” having being born into the digital era and thus more naturally capable and adaptable to the skills needed when using technology. (Prensky, 2001) But do we assume digital literacy? In 2015, the Pew Research Center reported that “in the US, about 5 million households with school-aged children did not have access to the internet at home.” and “many homes did not have laptops or computers” leaving students to use their phones to access websites and facilities online (as cited by Abumu, 2017 ). How can so many students without adequate access possibly become fully literate in the digital skills needed to sail through university? What does it mean to be digitally literate? And what of the “digital immigrants”: instructors and teachers who ventured into technology later in their careers. How might this polarisation limit development or become barriers to our students’ 21st-century progress? In his book of the same name, Paul Gilster describes digital literacy as “the ability to understand and use information in multiple formats from a wide range of sources when it is presented via computers.” (P Gilster, 1997). He says that being literate has never been solely about being able to read and write, but it is about understanding and making meaning from what we read. In 1974, Paul Zurkowski explains that “information is not knowledge” but that it is important for the consumer to know what to do with that information, how to work with it, and use it for other purposes, such as problem-solving. “Information is a tool to accomplish a purpose” (as cited by W Badke, 2010). Therefore we can ascertain that digital literacy is about interpretation, understanding and cognition of what we see. 20 years on from Gilster’s first use of the phrase, we must now look in more depth at what specific literacies are needed to enhance students skills to survive and thrive in the 21st century. 3 such resulting digital literacies are Information Literacy, Visual Literacy and Media Literacy. As communication changes with the advances in technology, these literacies are multimodal (C Jewitt, 2008) often combined and supportive. One cannot visit a website or blog, such as this, without finding it necessary to interpret an image alongside information. Being competent in understanding texts, interpreting images and other media through digital sources is the new backbone of education, as the internet is their primary source of learning both inside and outside of the classroom. As students become older and more independent learners, they are more vulnerable to a wider range of sources, including social media, and it is imperative that they are able to discern and navigate through this wilderness of information to find truth, meaning and understanding. In her TED Talk, “Creating critical thinkers through media literacy”,Andrea Quijada searches for “that untold story” in order to deconstruct stories, or decode adverts, films or other media. (A Quijada, 2013). A student of hers said that “media literacy connects school to real life”. Doug Belshaw, in the Essential Elements of Digital Literacies, agrees that learning should connect to students’ interests and it is with this relevancy that motivation occurs. (Belshaw, 2012). He advises that both adults and students need to be motivated by their own interest rather than being enforced and, as “digital immigrants”, motivation needs to be high to inspire adults to learn something new and potentially challenging. My septuagenarian mother was positively inspiring when learning how to use an iPad several years ago to communicate and connect with family and friends. With smartphones bringing the world literally to our fingertips, we consume and interact with so many sources of information every day. From videos to news sites and diagrams to data, we must learn how to interpret and understand this new form of knowledge and information. In the article “Connecting the Digital Dots: Literacy of the 21st Century”, authors Barbara Jones-Kavalier and Suzanne Flannigan advocate for the “need to teach true literacy – skills in analysis, synthesis and evaluation” (Jones-Kavalier and Flannigan, 2006). Referring to Bloom’s original taxonomy, these skills are essential for critical thinking. With the revised taxonomy, by Anderson and Krathwohl in 2001, synthesis is replaced by creating and it is this aspect of digital literacy which moves students from consumers to creators. Researching digital literacy brings forth multiple models, descriptions and articles. In order to move away from a description, Doug Belshaw, in his book and accompanying talk, identifies 8 essential elements of digital literacy: cultural, cognitive, constructive, communicative, confident, creative, civic, critical (Belshaw, 2012). It is here that he explains how Remix being at the heart of digital literacies (9:12). Just as Prensky talked about doing “new things in new ways” (M Prensky, 2005), Remix is about using new tools to create new learning. In the classroom, this might mean students use blogs to share their writing or artwork, communicating and collaborating with one another and connecting with students around the world for ideas and feedback: reading and writing remixed. In my classroom, art students still create art traditionally but use Padlet to share their progress and comment on each others’ work to review ideas. The tool changes how they interact and, as well as tracking their ongoing skills and progress, they can reflect and refine their work as a result. It visually keeps a record and students can see each others’ work to inspire or encourage where appropriate. This new form of participation and communication begins the process and practice to enhance their skills in new literacies. “Every time you’re given a new tool, it gives you a different way of impacting the world” (Belshaw, 2012). As students struggle to decipher the wealth of real and fake news online, schools are under increasing pressure to integrate meaningful critical digital literacy into their curriculum. Kavalier and Flannigan mention that “few organisations have developed comprehensive plans that specify technical learning objectives or ensure successful integration of technology to enhance students’ digital and visual literacy”. (Kavalier and Flannigan, 2006). I would like to say that things have moved on over the past 11 years since their article but it may not be the case worldwide as some schools are still grappling with the effective execution of relevant 21st-century skill-based learning. But children are not the only ones who need to learn these digital literacy skills. Many educators and administrators were not born into this digital world and also need to learn how to navigate and make sense of it in relation to their personal and professional lives. It is with this that I am reminded of our ongoing consultation my team have been working on to articulate digital literacy across the school. This is by no means an easy task and it has taken many meetings and research to decide on the skills necessary from Kindergarten to IB. iLearn, a 5 year programme at UWCSEA, was introduced in 2010 to integrate 1:1 laptops, and over time Google apps to GSuite and, more recently, Teamie, our dedicated online learning platform. At the beginning, much of this was new to us all but as time progressed students and teachers alike became more fluent in their use of these tools, utilising them each day as part of their teaching and learning. The articulation process is a collaboration, developing a whole school digital literacy programme to track what literacies and skills are needed to best equip our students. The focus areas we have agreed upon are citizenship in a digital world, researching, creating, communicating and collaboration with digital tools, managing and operating digital tools and computational thinking. The discussions are rich and the research invaluable in creating a curriculum with longevity, a tough task with such a changing world we live in. But is it enough just to be competent in modern literacies? When we learn a new skill, such as a new language, we aim for initial basic understanding, followed by competence, working towards fluency and this takes time and practice. It is so with digital skills. It takes time and experiences in multiple contexts to become more fluent in using technology, to select the appropriate tools and to be able to express ideas using them. In order to further refine our competencies and work towards more fluency in digital literacies, we must look to develop deeper skills in our students that go beyond consuming. It is important that we allow students to learn about the why as well as the how of digital technology. Mitch Resnick, in his 2012 TED talk, “Let’s teach kids to code”, talks with enthusiasm about the importance of understanding how computers work and therefore the need to teach coding. He suggests that we move from traditional literacies to fully understand the realm we are learning in: “Read – read to learn; coding to learn”. He mentions the importance of coding to “think creatively, systematically and communication” and that we can become more fluent “by understanding it, manipulating it and creating” (M Resnick, 2012). Belshaw and Resnick both talk about moving on from “elegant consumption” (Belshaw, 2012) to creating and where Remix is the new working model of creativity. To delve deeper into fluencies, Andrew Churches and Lee Watanabe Crockett, of the Global Digital Citizen foundation, developed the 6 essential fluencies of innovative learning. In their book, “Mindful Assessment: the essential fluencies”, real-time problem solving and collaboration are cited as one of the most needed skills in industries as diverse as mining. (Crockett and Churches, 2017) In their previous book, “Literacy is not enough”, they identified a set of skills that students would require to “become architects of a future world we can only imagine and masters of challenges we cannot imagine” (Crockett, Jukes and Churches 2011) which were based on this diagram’s 21st century skills (or essential fluencies). It is refreshing to see a modern take on fluency in education, written by educators for educators and how these can help us in developing global digital citizens. One can become overwhelmed with so many models, diagrams, and descriptions of what it must take to properly develop our youngsters for tomorrow’s world so we must sift through to find the best fit for our current school and context. We must weigh up the pros and cons and balance the needs of our schools with the wishes of our students. How do teachers keep abreast of new technologies to be competent let alone fluent in all aspects? In my classroom, we still work with traditional skills combined with modern technology, just as old literacies are just as relevant today as new multiliteracies. We still consume a lot of visual information and knowledge but we also look at remixing the old with the new, combining traditional forms of art with new and emerging ones. No one skill is enough to determine true fluency in art (or any other curriculum) and we cannot neglect the emergence of digital forms of art such as AR and VR. Just as Leonardo da Vinci utilised the lens as the modern technology of his era to develop the camera obscura and develop his art towards more realism, so too must we educators embrace the new world our students will be living and working within and help them to develop the necessary skills to be creators and innovators. Introducing the work of game designers, experimenting with immersive media like Teamlab, and yes, bringing coding into the art classroom may well be the new curriculum around the corner. This means we as educators must keep abreast of the new skills and needs our students require for their future careers and to make sure we are not left behind as“digital immigrants”. We must hone our digital literacies and converse with the younger generation to learn with them and thus become the empowering educators they need. To become more fluent, together we must utilise all we know from traditional literacy combined with what we now know about modern multiliteracies to best educate and equip students for the what the next 20 years will bring. With the dawn of a new era of modern media, who will be left behind to widen the gap even further? Gilster, P. (1997). Digital literacy age. John Wiley & Sons. Prensky, M. (2001). Digital natives, digital immigrants. Marc Prensky. What is Digital Fluency?. Available from: https://www.researchgate.net/publication/283266223_What_is_Digital_Fluency [accessed Jan 03 2018]. What were the first digital tools you used? How has your practice changed over the years because of the digital tools available to you? What will be the next transformative tool we cannot imagine teaching without? Here, created using Knight Lab Timeline is an interactive visual documenting a selection of the tools I have used professionally and personally. Scroll to the right to follow the timeline or click the arrow to navigate. What is your most frequently used digital tool? Which could you not do without? If you want to make your own timeline the website is very easy to follow, and there are many tutorials online.